I have 2 dilemmas – now that baby W is over a year old, should I be calling him toddler W?! It doesn’t have the same ring to it…. the other dilemma, well I was wondering whether to carry on with these monthly updates after a year but he’s developed loads in the last month so yes I will carry on haha! So I told you the day after his birthday, he took a few steps – well a month later and he is proper walking, a lot! The last week has been so much fun watching him, we all get so excited!!! He’s tries to use his fork and spoon now – I haven’t been trying to teach him this so not sure if he’s got it from copying me, or whether it’s something he’s picked up from the childminder… either way, it’s very cute and grown-up but it does mean he’s eating less food as not much food is making it on the full journey from table to cutlery to mouth! 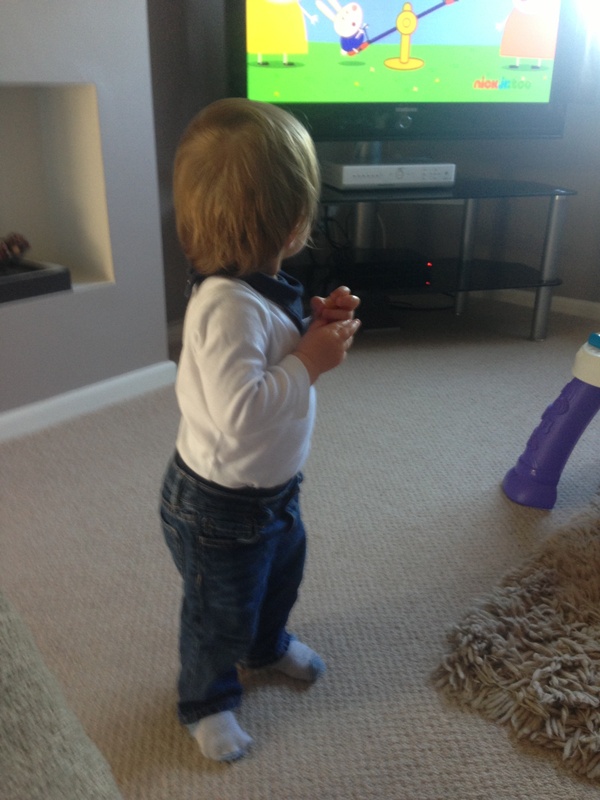 He knows which buttons to press on the remote control to turn the TV on!! A few days ago he pointed at me through the window and said ‘mama‘ – melted my heart! Blows on hot food with a ‘frrrr‘ sound, again copying what I do! He can climb up to, and get on, the sofa – eek! So yeah it’s been a busy month! Baby W had his 1 year jabs and then a week later seemed to suffer from side-effects including a rash – but it co-incided with teething with his first canine (tooth #9) trying to come through – so we all had a tough few days, poor thing! Other than that, all good – still not had him weighed. He’s outgrowing most of his 9-12 month clothes, but everything 12-18 months seems massive on him! He’s still on milk first thing and last thing every day, and we’ve got into a bad habit at home of giving him milk with his naps. It’s funny, he’s dropped his afternoon naps at the childminders, and yet on the Fridays he’s at home with me, he has 2 really long naps – I think she tires him out and then Friday is his chill-out day! 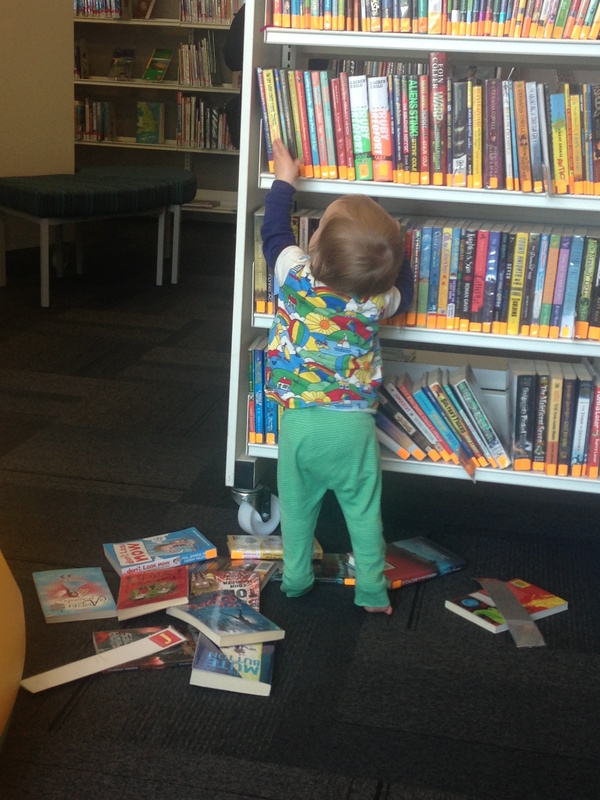 Making a right mess in the library! 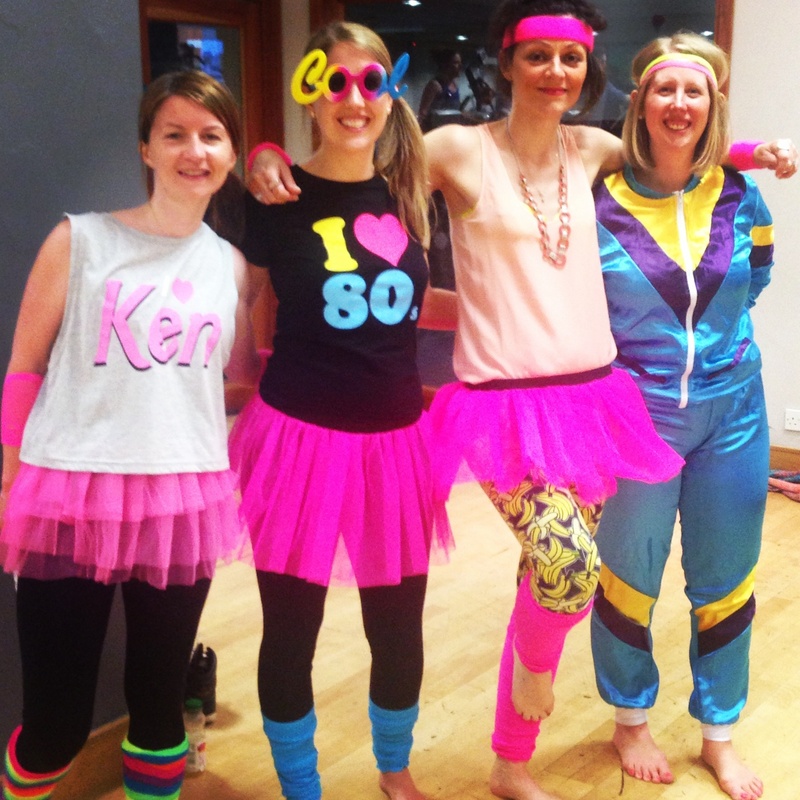 This momma was fortunate enough to go on a fab hen weekend a few weeks ago, 18 girls in one HUGE house called New Yatt farm in Oxfordshire – check it out here, it was amazing! 2 nights in with good friends, lots of booze… and a hunk in trunks.. and we went punting and disco dancing, it was ace – just what the doctor ordered although I was absolutely drained the week before and after – really need our holiday now!